WEST LAFAYETTE, Ind. — Jim Danielson and Sean Kleinschmidt spent the summer before their freshman year at Purdue University turning a Porsche with a blown engine into an electric-powered vehicle. 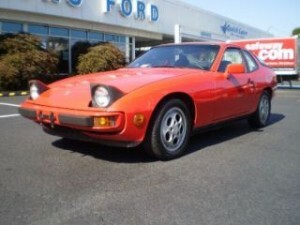 Purdue Freshmen Jim Danielson and Sean Kleinschmidt spent last summer turning a 1987 Porsche 924S -- like the one pictured above -- into an electric-powered vehicle. Their red, 1987 924S will be one of the featured vehicles at the alternative and fuel-efficient transportation show that is part of Purdue’s Green Week. The show will be from noon to 4 p.m. Thursday (Sept. 24) on the west side of Stewart Center. Danielson of Arlington Heights, Ill., and Kleinschmidt of Prospect Heights, Ill., are high school friends who are now first-year engineering students. They started work on the car in late May and finished in early August. They bought the Porsche for $500, then sold parts from it that they didn’t need for about the same amount. They spent about $6,000 on the conversion. They hope to get $4,000 of that back through an Illinois program that rebates costs for alternative-power conversions. The car runs on a deep-cycle, lead acid marine battery and a forklift motor. At this point, it can reach a speed of 55 miles an hour. But the Porsche has a range of only about 50 miles on each battery charge, so Danielson and Kleinschmidt will bring it to West Lafayette on a trailer. The Purdue Sustainability Council is sponsoring the Green Week transportation show. It also will feature vehicles from Purdue’s hybrid fleet, student-built solar race cars, a battery-powered Volkswagen Beetle built by a professor, a Volkswagen Rabbit converted to run on biodiesel fuel including used vegetable oil, and even a motorized couch. Judged and people’s choice awards will be given in the fuel-efficient and alternative-powered categories. Also during the transportation show, the Boiler Green Initiative will offer free bicycle tune-ups.